The way to a man’s heart is through his…closet? If he’s a professional, an athlete, or an outdoor enthusiast, he probably has the gear and wardrobe to support it. 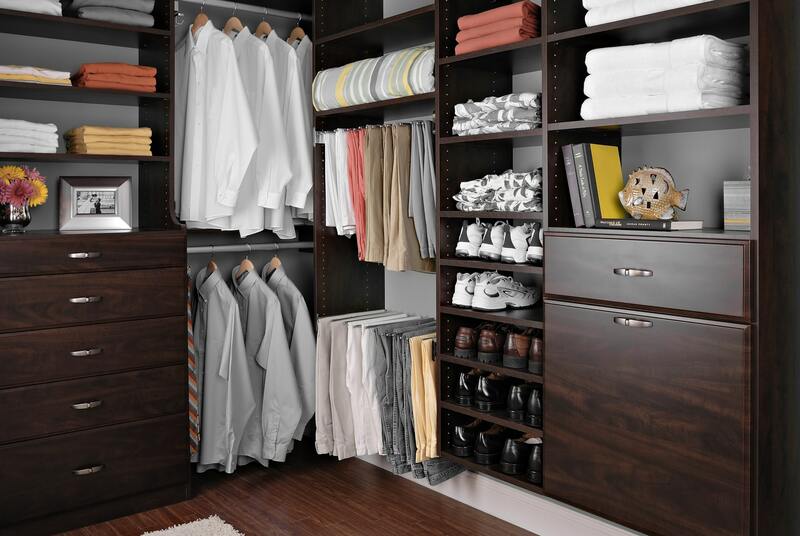 Help your guy keep it all organized with a well-equipped closet system that's designed to meet his personal needs. Read on for our guy-friendly organization options and ideas. First and foremost – create room for hanging clothes! Many male clients we work with cite this as their top priority while designing their new closet system. When planning a closet for him, allocate plenty of space for storing all of his shirts, pants, suits, jackets and more to keep his clothes organized and ready to wear. Choose double hanging rods on the back closet wall to make efficient use of corner storage space and pull-out racks to keep pants in perfect order. Curtain rings, clothing hangers or stationary hooks may seem like a suitable storage solution, but doesn’t your guy deserve a better way to store his belt collection? 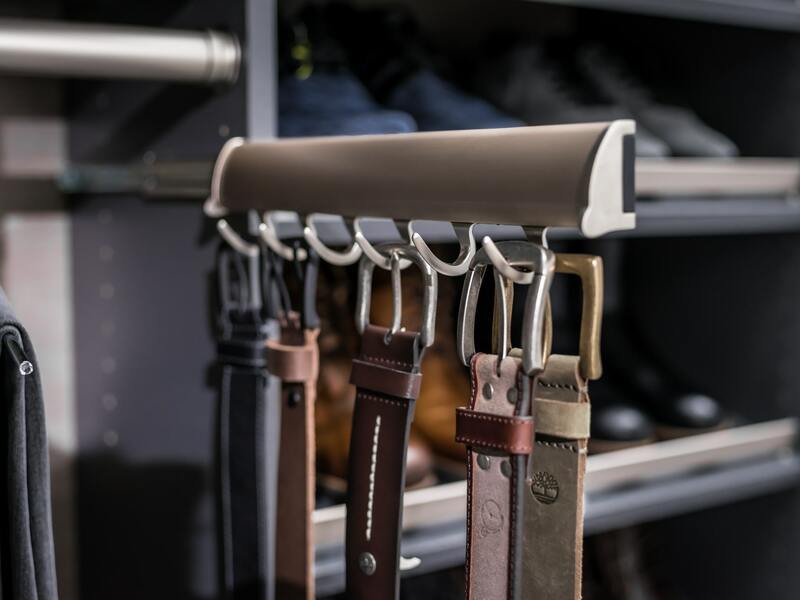 A sophisticated slide-out belt rack is a perfect addition to his custom closet. This rack extends out smoothly to store belts neatly on six hooks, keeping them in view – and within easy reach – and pushes back into the closet to keep belts stored out of the way. It’s time to tackle those ties! 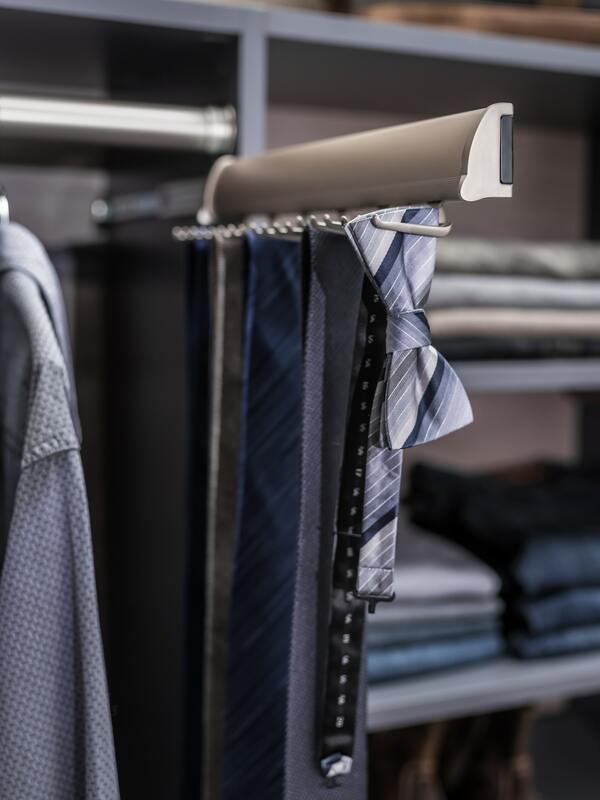 Make it simple to keep his neckwear neat, organized, and easily accessible along one side of hanging clothes with a slide-out tie rack. This 14” long rack features 18 hooks and is available in several finishes. 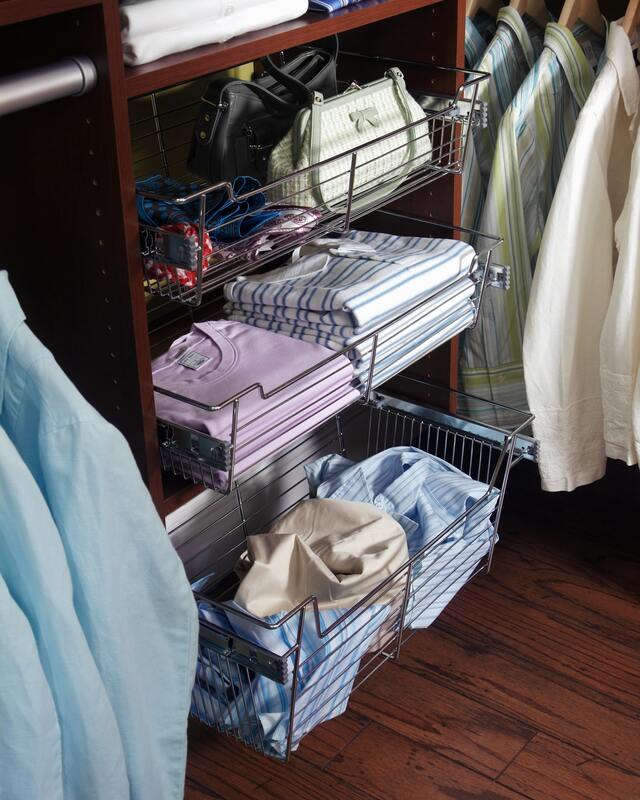 If closed storage seems to create chaos in his closet, opt instead for open-view shelving and baskets. With handy slide-out baskets that can be used as a hamper or extra storage, your man will have visibility into the contents of each, making it simple to grab items he needs or toss them in a hamper after they’ve been worn. Messy sock drawer? No more! 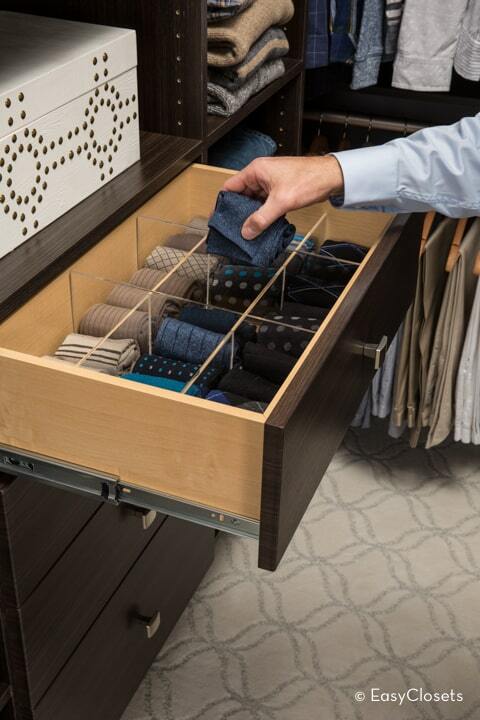 Pull-out drawers fitted with compartments make it easy to stay organized – especially when it comes to smaller, loose items like socks, underwear, and more. This clear acrylic divider inserts into a 24” wide drawer to create nine sections for separating and storing items. 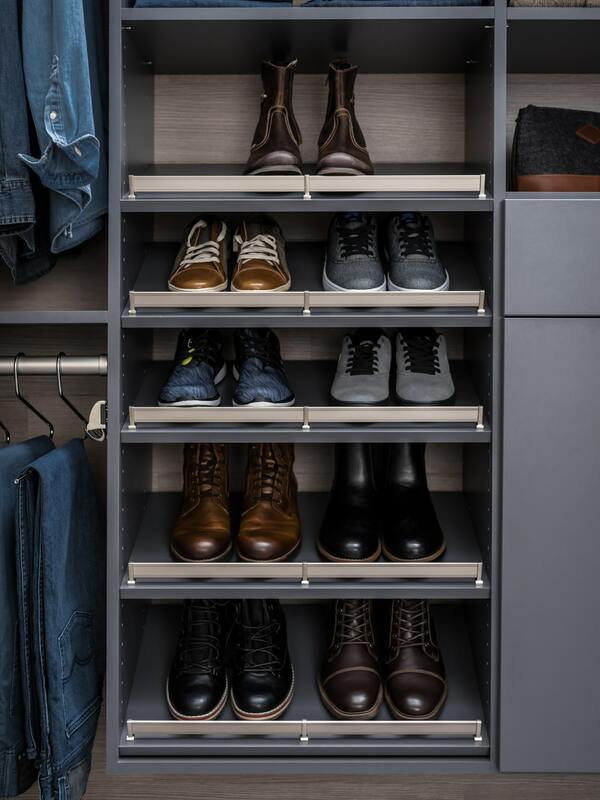 For the man with many shoes (maybe even more than you), a smart shoe organizer can help make his life a little easier. With adjustable shelving, you can get shoes up and off the floor and place them within reach so they’re simple to find and put away each day. Choose from a range of shoe storage options, including straight and slanted shelves or the new Adjustable Shoe Organizer. Our sleek storage designs keep shoes visible, tidy, and easy to grab-and-go. Slanted shelving with metal fences ensure shoes stay in place, and adjustable-height shelves keep storage in line as his shoe collection grows or changes. No matter your man’s style or storage needs, a good organization system is one that adds efficient organization wherever he needs it most – while making it simple to maintain a tidy space. To see how you can help improve organization for that someone special, browse EasyClosets gallery or contact a professional closet designer. Get started today.